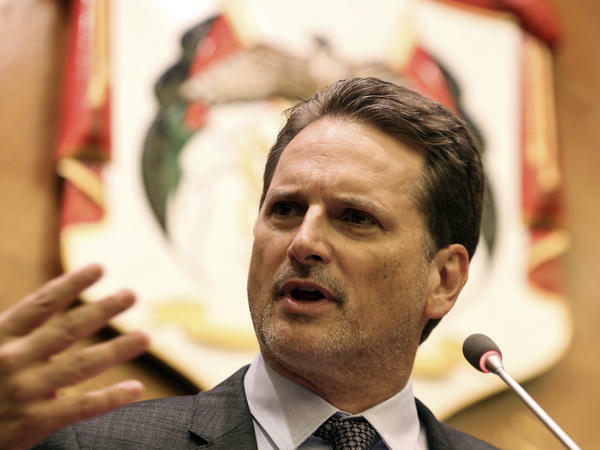 Pierre Krahenbuhl, Commissioner-General of the United Nations Relief and Works Agency for Palestine Refugees (UNRWA), speaks at a press conference in Amman, Jordan, on Thursday. On Friday, the U.S. announced it would cease funding of the aid organization. The Trump administration announced on Friday it would cease all funding of an agency that provides services to more than 5 million Palestinian refugees. It is a reversal of decades of U.S. policy on a core issue of the Israeli-Palestinian conflict. "The United States will no longer commit further funding to this irredeemably flawed operation," State Department spokeswoman, Heather Nauert said in a statement. In previous years the U.S. has provided more than $350 million — about a third of the annual budget of the United Nations Relief and Works Agency. The organization uses the funds to run schools and clinics for Palestinian refugees in occupied territories — the West Bank and Gaza — as well as those in Jordan, Syria and Lebanon. The White House's withdrawal of support has been expected for some time; It had suspended most of the aid in January after making a $60 million contribution. At the time officials said the department was reassessing future aid, and called on other countries to take on greater financial responsibility. "We made it clear that the United States was no longer willing to shoulder the very disproportionate share of the burden of UNRWA's costs that we had assumed for many years," Nauert said in the statement. "We reject in the strongest possible terms the criticism that UNRWA's schools, health centers, and emergency assistance programs are 'irredeemably flawed'. These very programs have a proven track record in creating one of the most successful human development processes and results in the Middle East. Gunness added that, "UNRWA will pursue with even greater determination and engagement its mobilization of existing partners, 20 of whom have to date contributed more money than in 2017." In recent months, neighboring Arab and European countries have pledged to protect the aid organization. Just hours before the State Department announcement on Friday, Germany agreed to significantly boost funding, the AP reported. The Times of Israel reported that "Jordan said Thursday it would host a fundraiser at the United Nations headquarters in New York next month to keep UNRWA afloat." But international efforts appear to have done little to assuage the Trump administration's concerns over the U.N. agency's fundamental business model, which it called "simply unsustainable" and described as being in "crisis mode for many years. Palestinians have accused the White House of using the agency — and the welfare of refugees — as a bargaining chip to pressure Palestinian leadership into a U.S.-brokered peace deal with Israel. Palestinian leaders have cut contact with the U.S. since the Trump administration backed Israel's claim of Jerusalem as its capital. Palestinians want part of the city for a capital for their future state. "Hundreds of thousands of Palestinians fled or were forced from their homes during the war that led to Israel's establishment in 1948. Today, there are an estimated 5 million refugees and their descendants, mostly scattered across the region — a figure that has become a point of contention. Palestinian leaders assert the right of those refugees to return to land now under Israeli control." Aaron David Miller, a former U.S. negotiator in Mideast peace talks, warned on Twitter that the cuts could lead to instability, and end up costing Israel. "Defunding UNWRA — whatever its flaws — is a mistake," Miller wrote. "It will harm Israeli security; create openings for Hamas on the West Bank; and create a situation in which Israel will be stuck — one way or the other — with the check." The State Department did not address concerns that the U.S. may try to pressure the United Nations into reducing the number of Palestinians given refugee status. But Nauert said the U.S. is concerned about the impact of its funding cuts on quote "innocent Palestinians" — and suggested it may give direct aid instead. "The United States will intensify dialogue with the United Nations, host governments, and international stakeholders about new models and new approaches," she said in the statement.